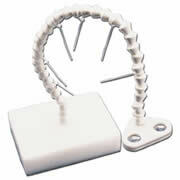 Free up benchtop space by mounting holders on wall for easy dispensing of gloves. Made of clear acrylic, they include a polyester foam insert to securely hold a range of glove box sizes. The modular design holds single boxes or can be a horizontal stacking multiple box holder. Made from high-impact, durable resin, they are resistant to harsh cleaning solutions. Universal fit for most major brands of glove boxes. The Anti-Microbial version (blue) is ideal for use in clean rooms, hospitals, and microbiological work areas. The Microban additive prevents growth of molds and bacteria. Microban antimicrobial protection has been built-in to our antimicrobial glove boxes during manufacturing. When microbes, such as bacteria, mold, and mildew that can cause stains, odors and product deterioration come in contact with the glove box surface, Microban protection penetrates the cell wall of the microbe and disrupts key cell functions so that the microbe cannot function, grow, or reproduce. Microban protection is an intrinsic part inside and at the surface and will not wash off or wear away for the useful lifetime of the glove box. The mounting screws are included. Organize your lab safety glasses with this holder, at your reach when you need it. Ideal for organizing your labbooks, instruction manuaks or references. The book holders secure to the surface with double sided tape or magnets. These tool holders help keep your tools ready at your finger tips any time you need them. With double sided tape or magnet you can secure this holder at any place you want. For the storage or carriage of wash bottles or solvents. Available in two sizes: 4" holes (white) and 2 7/8" holes. Six-pack storage, convenient carrying handles. Sturdy construction and they are resistant to solvents. 13.5" x 10" x 11" H.
Solve the problem of washing pipettes quickly, safely and with little effort. To use allow dirty pipettes to soak in the pipette basket in the pipette jar and when ready the basket is transferred to the washer where a constant flow of tap water rinses the pipettes clean. Gamma (g) rays are produced when an unstable isotope such as 125I enters into nuclear decay; this form of electromagnetic radiation is attenuated by lead. The gamma rays intensity increases exponentially as the thickness of the lead increases. The recommended thickness of lead for use with 125I is 0.5mm. We use 3mm lead for all of our g protection products. Other isotopes shielded by our products include 32P, 51CR, 35S, 33P, 3H, and 14C. The enclosed boxes are perfect for shortterm storage of isotopes and contaminated labware. All our gamma disposal boxes feature a polyethylene liner and sleek black acrylic exterior. This flexible arm assists by holding and positioning electrodes or other objects in an direction. The base is solid polyethylene and comes complete with 3-M double sided mounting tape on the bottom to secure the unit to the table top. The unit is available in either a one or two hole head configuration.